A top reformist lawmaker has pledged to investigate the arrests by Iran’s Intelligence Ministry of dozens of university students during the country’s recent nationwide protests. “According to a list that was given to me, about 90 students have been arrested throughout the country in the past few days,” Parvaneh Salahshouri, the leader of the women’s faction in Iran’s Parliament, told the Iran-based Jame’e No news website on January 5, 2018. The lack of information provided by officials about the more than one thousand people detained during the anti-government demonstrations that broke out in Iran on December 28, 2017, has caused serious concern among the detainees’ families. To date, neither the Intelligence Ministry nor the judiciary has released the names of the detainees. At least 25 people have been killed during the unrest, which lasted more than a week after the first protest on December 28. On January 7, 23-year-old Sina Ghanbari died of unknown causes in Evin Prison. The authorities claimed he hung himself. Sixteen reformist MPs urged support for the protesters on January 7. “These protests, and their violent continuation are the outcome of nothing but the lack of institutions for the peaceful resolution of political and social conflicts. There are no avenues for non-violent protest and the legal right to protest is not recognized,” said the statement published in the Shargh newspaper. The majority of reformist politicians, who have led protests and movements in Iran since the 1990s, were noticeably absent from and silent on the unrest that began on the eve of 2018. Prominent human rights lawyer Nasrin Sotoudeh pointed out that some reformist politicians also incorrectly claimed that the protests were illegal. “It’s not just the conservatives who are constantly claiming the protests are illegal but also some reformists as well,” she told CHRI, adding that the people’s right to peaceful freedom of assembly is guaranteed in Iran’s Constitution. For the past few days, dozens of relatives of the detainees, as well as civil rights activists, have been gathering outside Tehran’s Evin Prison to get information about their loved ones. More than 40 Iranian university students, mostly activists, were arrested between December 30, 2017, and January 4, 2018, according to credible information received by CHRI. “I have precise information that some of the detained students were not even in the protests,” tweeted reformist MP Mahmoud Sadeghi on January 5. 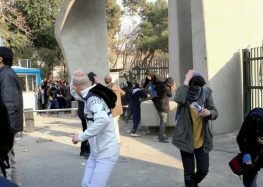 “Reports about the detention of students during the recent unrest are worrying, especially since none of the officials have provided any explanation,” Fatemeh Saeidi, another reformist member of the women’s parliamentary bloc, told the semi-official Iranian Students’ News Agency (ISNA) on January 5. Rouhani, who enjoyed widespread support from university students during his 2013 and 2017 re-election campaigns, promised to de-securitize Iranian universities, which have often served as the focal point of protest movements in Iran. “Hassan Rouhani’s government claims to be moderate but his Intelligence Ministry has arrested members of a legal student trade union organization only because they asked where the detained students were being held,” a student activist in Tehran who asked not be named for security reasons told CHRI. “Rouhani promised to make universities safer for students but instead they have turned into military fortresses and more and more students are being arrested every day,” added the source. CHRI has confirmed the names of 43 detained university students. A senior government official recently stated that the vast majority of the hundreds who have been detained around Iran are young people. “More than 90 percent of the people arrested in these unrests were young people and teenagers under the age of 25 and virtually none of them have any arrest history,” said Hossein Zolfaghari, Iran’s deputy interior minister for security affairs, on January 1. Iranian newspapers have also reported the arrest of a 15-year-old boy identified as “Afshin” in Tehran. “We don’t know where he is. He called just to say he had been arrested and would be freed soon,” his mother told Shargh on January 3.